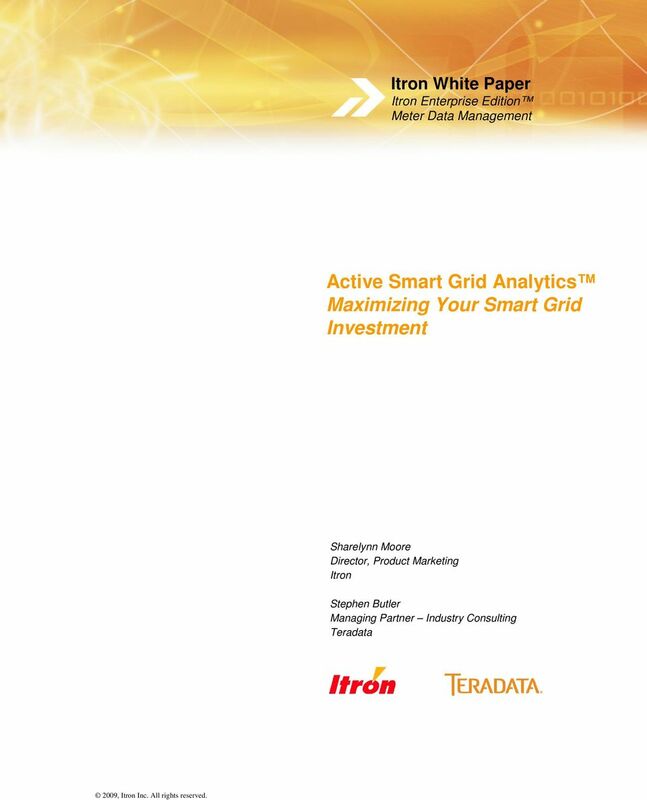 Download "Active Smart Grid Analytics Maximizing Your Smart Grid Investment"
1 Itron White Paper Itron Enterprise Edition Meter Data Management Active Smart Grid Analytics Maximizing Your Smart Grid Investment Sharelynn Moore Director, Product Marketing Itron Stephen Butler Managing Partner Industry Consulting Teradata 2009, Itron Inc. All rights reserved. 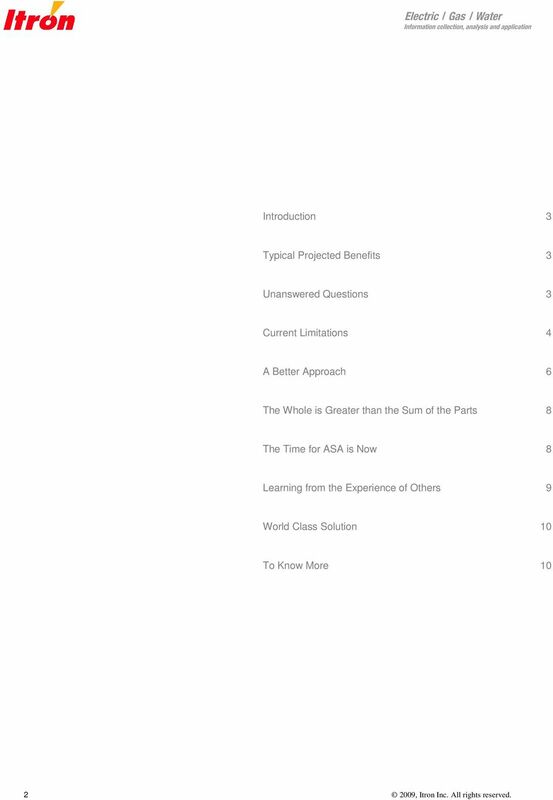 2 Introduction 3 Typical Projected Benefits 3 Unanswered Questions 3 Current Limitations 4 A Better Approach 6 The Whole is Greater than the Sum of the Parts 8 The Time for ASA is Now 8 Learning from the Experience of Others 9 World Class Solution 10 To Know More , Itron Inc. All rights reserved. 4 As a customer, I am considering purchase of a plug-in hybrid electric vehicle (PHEV). My utility will purchase the excess energy, but since the PHEV energy purchase price varies, how do I determine my energy credits and decide if purchasing a PHEV would be an economic choice? As a utility CFO, I am weighing recommendations from our engineering department on a number of capital improvements to our distribution system. I am unable to fund all of these improvements. How do I determine which of these projects will benefit the largest group of customers, by what amount, what the financial return to the company will be for each project under consideration, and, for the projects not funded, what the effect on service reliability will be for specific customers and groups of customers? As a utility operations manager, I must decide whether to take equipment out of service for needed maintenance. If I take the equipment out of service now, during our critical peak demand period, what will be the impact upon the cost of energy to our customers and to the company? If I defer the maintenance, the risk of equipment failure, unplanned outage and even higher costs is present. What information do I have to make the correct decision? To answer questions such as these, ready access to integrated customer, financial and operational information along with the application of advanced analytics is necessary. Achieving maximum return on a Smart Grid investment depends on being able to provide timely and insightful answers to these and similar questions. 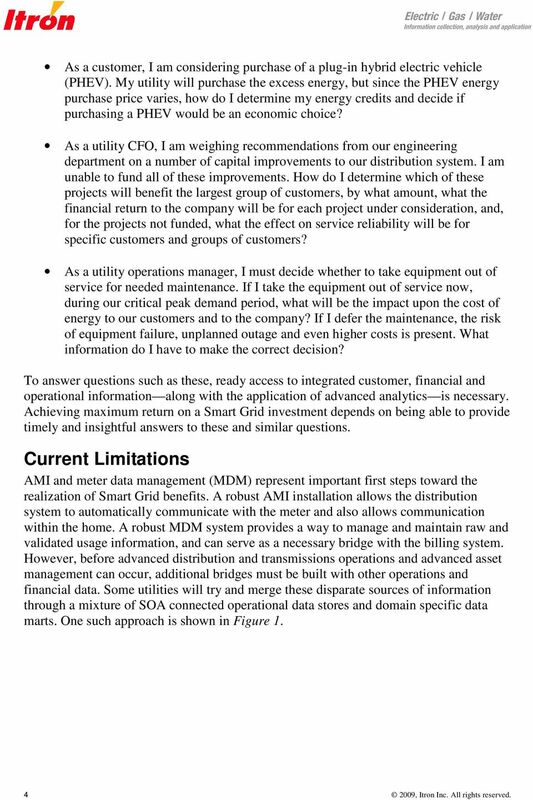 Current Limitations AMI and meter data management (MDM) represent important first steps toward the realization of Smart Grid benefits. A robust AMI installation allows the distribution system to automatically communicate with the meter and also allows communication within the home. A robust MDM system provides a way to manage and maintain raw and validated usage information, and can serve as a necessary bridge with the billing system. However, before advanced distribution and transmissions operations and advanced asset management can occur, additional bridges must be built with other operations and financial data. Some utilities will try and merge these disparate sources of information through a mixture of SOA connected operational data stores and domain specific data marts. One such approach is shown in Figure , Itron Inc. All rights reserved. 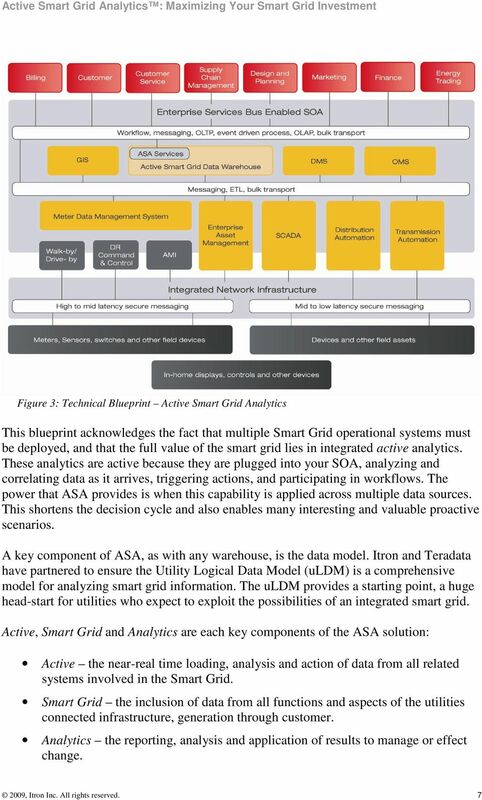 6 A Better Approach Active Smart Grid Analytics (ASA) and the Active Smart Grid Data Warehouse (Figure 2), jointly developed by Itron and Teradata, provide a more extensible architectural approach that is not only easier to operate and maintain, but will also facilitate the application of near real-time analytics and enable smarter, faster decisions. 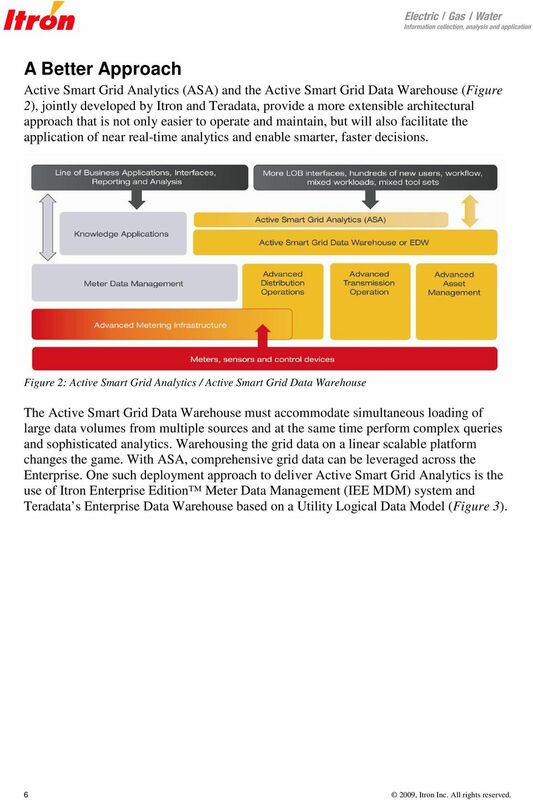 Figure 2: Active Smart Grid Analytics / Active Smart Grid Data Warehouse The Active Smart Grid Data Warehouse must accommodate simultaneous loading of large data volumes from multiple sources and at the same time perform complex queries and sophisticated analytics. Warehousing the grid data on a linear scalable platform changes the game. With ASA, comprehensive grid data can be leveraged across the Enterprise. 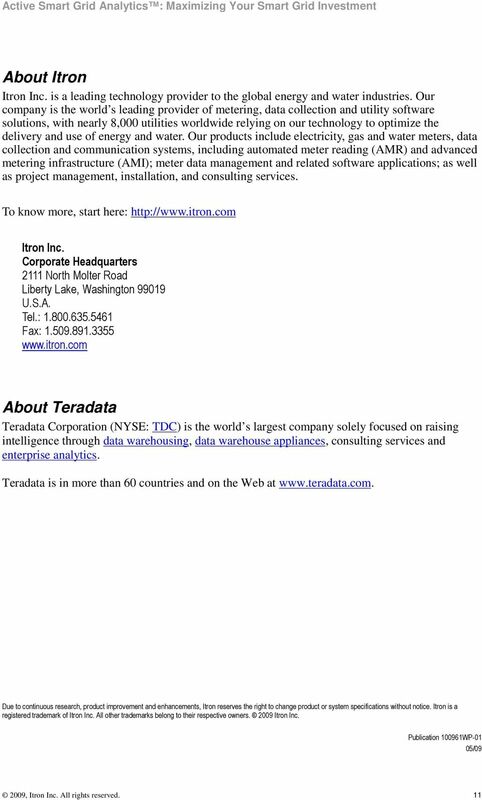 One such deployment approach to deliver Active Smart Grid Analytics is the use of Itron Enterprise Edition Meter Data Management (IEE MDM) system and Teradata s Enterprise Data Warehouse based on a Utility Logical Data Model (Figure 3) , Itron Inc. All rights reserved. 8 The Whole is Greater than the Sum of the Parts ASA s benefits come from the fact that correlation and analysis of adjacent data domains create more value than analyzing them independently. Combining AMI data and asset information with billing information assures that energy used and metered is billed. However, ASA extends the value of that same information. 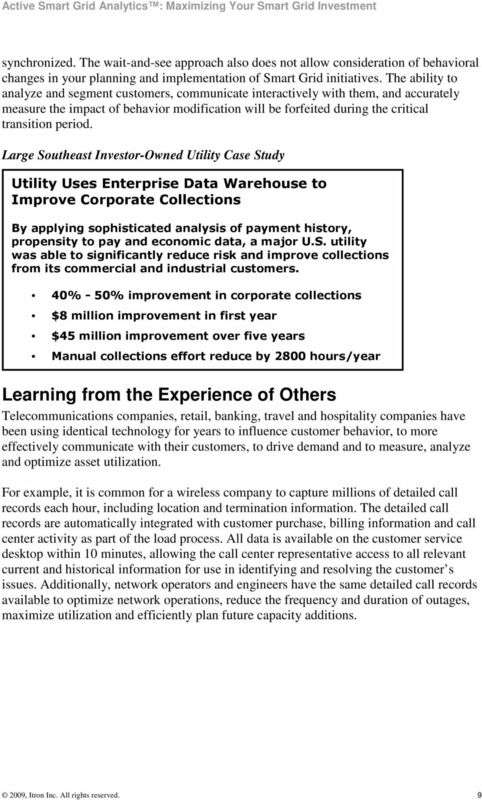 Further combining that information with financials, customer calls and historical data Here are some examples of the potential value of analytics that could be applied: The cost of service and profit associated with a specific demand response program can be easily calculated for an individual customer, segmented group or program basis. Program participation can be better predicted through analysis of historical behavior and current trends. Through real-time analysis of detailed data, service interruptions are anticipated or detected, located and diagnosed quickly, allowing system dispatchers to immediately focus on getting needed resources to the field to correct the problems. More detailed and accurate load forecasts are possible, enabling system planners to better predict asset loading and more accurately determine the nature and timing of capacity additions. Complete, historical, time-stamped information provides the basis for a more accurate projection of future peak loads. Future overloads and voltage constraints are more accurately identified, reducing unnecessary conservatism in current planning decisions. Transmission and distribution operators are able to adjust system flows to increase the loading of underutilized assets. Loading of assets under stress is reduced to lower probability of failure and extend service life. Improved load management allows more energy to be delivered per KVA of installed capacity. Each customer is notified by preferred channel, e.g. cell phone, text message, , alternate phone, etc. of a service interruption and kept informed of the projected time of service restoration. 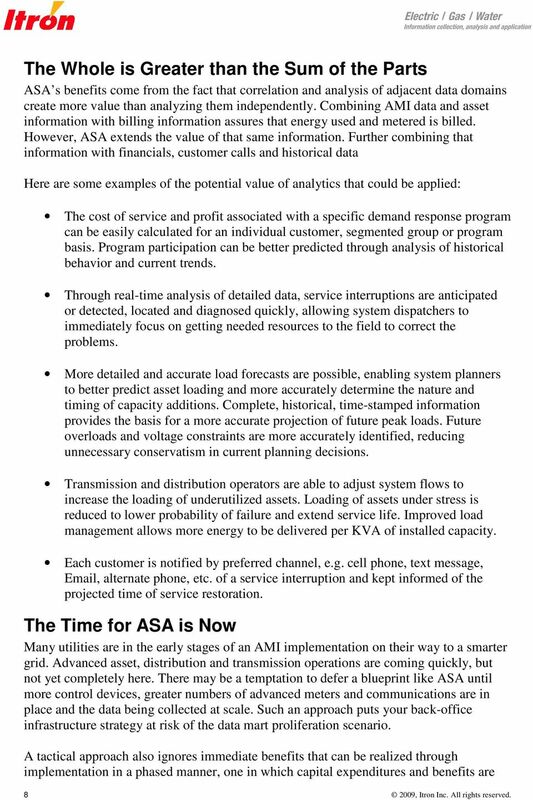 The Time for ASA is Now Many utilities are in the early stages of an AMI implementation on their way to a smarter grid. Advanced asset, distribution and transmission operations are coming quickly, but not yet completely here. There may be a temptation to defer a blueprint like ASA until more control devices, greater numbers of advanced meters and communications are in place and the data being collected at scale. 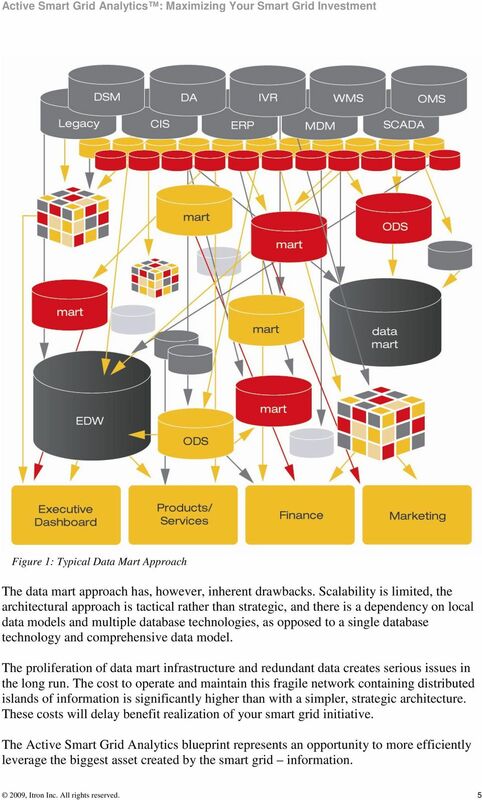 Such an approach puts your back-office infrastructure strategy at risk of the data mart proliferation scenario. A tactical approach also ignores immediate benefits that can be realized through implementation in a phased manner, one in which capital expenditures and benefits are , Itron Inc. All rights reserved. 10 World Class Solution Itron and Teradata, world class companies, have pooled their expertise to create the blueprint for Active Smart Grid Analytics, an integrated world class platform for the Smart Grid. 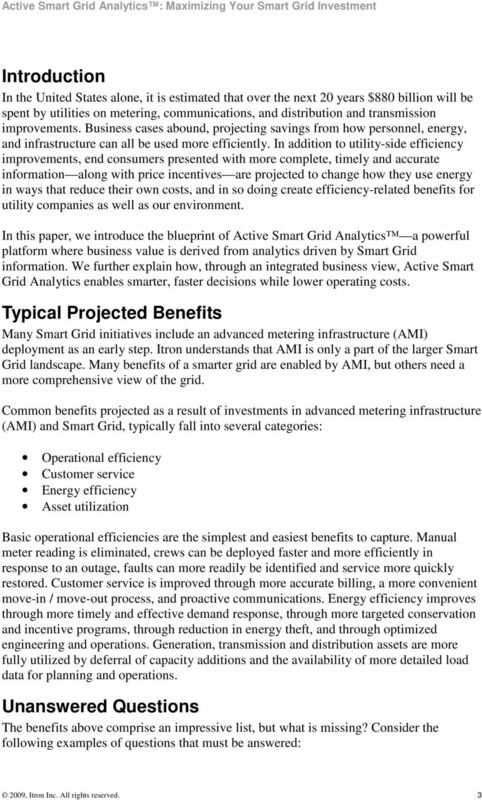 Active Smart Grid Analytics is needed now to achieve maximum benefits from investments in Smart Grid technology for these reasons: Operational data systems such as meter data management, SCADA and others alone cannot provide the extensive cross domain analytics and warehousing that Smart Grid business intelligence requires. Utilities need a blueprint for a best-in-breed Smart Grid enterprise software architecture that will plug into their SOA, and also enable active analytics derived from multiple domains. Teradata, the world s leading company in data warehousing, and Itron, the world s leading company in metering and meter data management for utilities, are complementary and proven technology providers. ASA represents a vision and commitment to apply our core-competencies to smart grid, now. 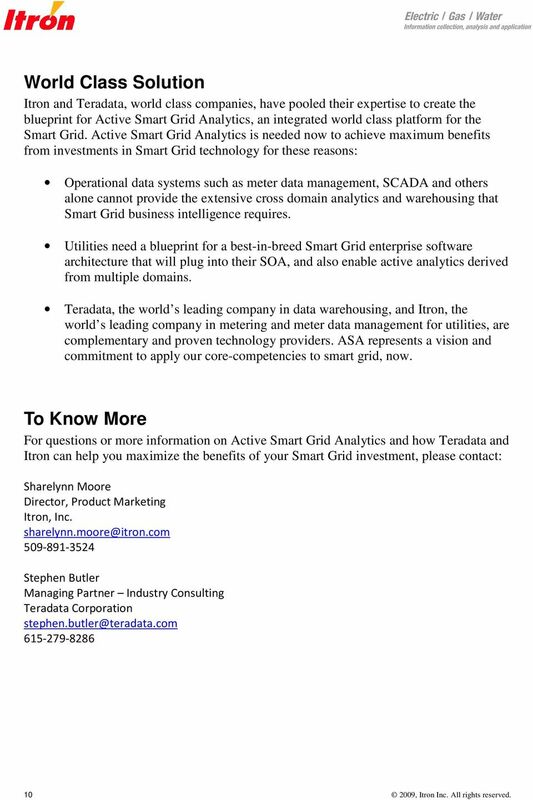 To Know More For questions or more information on Active Smart Grid Analytics and how Teradata and Itron can help you maximize the benefits of your Smart Grid investment, please contact: Sharelynn Moore Director, Product Marketing Itron, Inc Stephen Butler Managing Partner Industry Consulting Teradata Corporation , Itron Inc. All rights reserved. Best Practices for Creating Your Smart Grid Network Model. By John Dirkman, P.E. Conquering Data and Analytics Obstacles in Smart Utilities. Copyright 2010 SAS Institute Inc. All rights reserved. Unlocking the opportunity with Decision Analytics Not so long ago, most companies could be successful by simply focusing on fundamentals: building a loyal customer base through superior products and services. Data Center Infrastructure Management. optimize. your data center with our. DCIM weather station. Your business technologists.